In 60 years of life, Arcangelo Corelli composed comparatively little, yet his reputation and the influence he wielded on the art of violin playing loomed large. Virtually his entire output is comprised of six opus numbers—four sets of trio sonatas for two violins and continuo, six sonatas for a single violin and continuo, the last of which contains the famous variations on La Folia, and the 12 concerti grossi, op. 6 recorded here. This last opus, the work for which Corelli is mainly celebrated, wasn’t even published until 1714, a year after his death. In his day, Corelli was acclaimed as one of Italy’s leading violinists, numbering among his students Locatelli and Geminiani, but his activities as a composer were severely circumscribed by his self-critical temperament. The quip about Vivaldi writing the same concerto 600 times might be applicable to Corelli as well, though in a slightly different way. Instead of writing 600 concertos, he wrote 12, and then spent years refining, polishing, and perfecting them. Nor was his critical attitude aimed only at himself. He disdained virtuosity for its own sake as tasteless and looked askance at those who cultivated a flamboyant style of playing. Looking at and listening to Corelli’s music, one could be forgiven for wondering what all the fuss is about. Heinrich Ignaz Franz Biber (1644–1704), Corelli’s almost exact contemporary in Germany, advanced violin technique way beyond anything Corelli ever contemplated, exploring the instrument’s higher positions, double-stopping, scordatura tuning, and intensive polyphonic capabilities. Compared to that, a good deal of Corelli’s writing seems almost designed for amateurs, rarely taking the violin above third-position D on the E string, avoiding double-stops, and generally favoring ease of execution. Seeing Corelli, however, as one who advanced violin technique is probably a mistake, and it misses the significance of his influence on subsequent generations of players. His main contribution was to a style of playing, one we tend to identify as typically Italian. It’s a style steeped in song and the human voice—the smooth, mellifluous, predominantly stepwise motion of cantilena. And if that’s what Corelli’s music is about, it has found matchless expression in these performances by the Avison Ensemble. Three first violins, three seconds, two violas, a cello, and a violone make up the ripieno group, while two violins, a cello, and an archlute make up the concertino, with, of course, a harpsichord in the mix to underpin harmonic progression. This fully satisfies my oft-stated requirement that concertos, solo or grosso, need to have more than one player per part in the larger ensemble, otherwise, the defining contrast between the ripieno and the concertino is lost. But beyond matters of staffing, the playing by these musicians is simply thrilling. Fast movements are alive with brisk tempos, sprung rhythms, absolute unanimity of ensemble, and an air of crackling electricity, while slow movements are an ideal realization of Corelli’s cantilena principle, sung with the most expressive tenderness imaginable and with what can only be described as a majestic poignancy. Though at present, there aren’t that many complete sets of the concertos listed, I certainly haven’t them all. But I have heard those by Ross Pople with the London Festival Orchestra, by Neville Marriner with the Academy of St. Martin in the Fields, by Adrian Shepherd with Cantilena, and by I Musici, all on modern instruments, and by Trevor Pinnock with the English Concert on period instruments. To tell the truth, I can’t recall a single one of them where I was able to listen to all 12 concertos in a single sitting without growing bored. 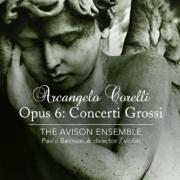 Pavlo Beznosiuk and the Avison Ensemble made me want to start over again from the beginning and listen to all 12 concertos a second time, that’s how enlivening I found these performances. Linn’s SACD recording, no doubt, adds immeasurably to the dimensionality of the sound stage and the listener’s ability to focus in on individual instruments. This is an essential addition to the Corelli discography. Urgently recommended.